The REAN NYS240BG from Neutrik is a three-pole 3.5mm cable jack with a black metal handle. 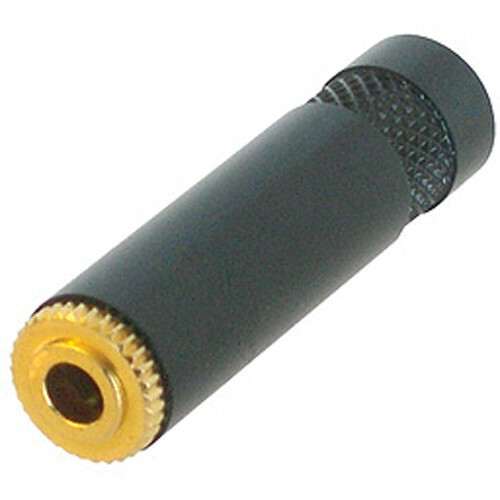 The connector sports gold-plated contacts and is suitable for cables with a maximum of outer diameter of 4mm. Box Dimensions (LxWxH) 1.5 x 0.6 x 0.6"
REAN 3.5mm Stereo Jack with Gold Contact-Plating (for Cables up to 4mm) is rated 4.8 out of 5 by 5. Rated 5 out of 5 by Frank from Quality Jack I purchased this to make a TRRS to TRS cable to connect a Lav mic (un-powered) to an iPhone. Using this along with a Sparkfun's Audio Cable TRRS (11580) I easily created a cable to record audio to an iPhone's 4-pin (TRRS) plug from a Lav mic. The quality is perfect, making re-using if needed one day quite simple with its simple screw on and off style. The black makes it look simple, but it is metal. There's no documentation however, but a little trial and error was all that's needed to find the correct pins. Rated 4 out of 5 by Ivan_ef from Designed for thin cables I was looking for a sturdy metal 1/8 headphone jack. This product feet my needs, but it accepts cables thinner than I planned to use. So I had to drill a bigger hole in the jack cover. However it's easy to solder and assemble it. Rated 5 out of 5 by Theodore G. from Simple yet solid Excellent quality that is to be expected from neutrik/rean.